Nader Elguindi is an expert on leadership and motivation. As a U.S. Navy Submarine Officer, Nader had a terrible accident that severed both his legs and caused him to lose his right foot. He overcame the accident and went on to become the first naval officer to complete his qualifications in submarines with a prosthetic leg. After the Navy, Nader became a tireless entrepreneur and built a nationally recognized services company, Cydecor, from scratch, acquiring clients such as Hendrick Automotive Group, Duke Energy, Charlotte Copy Data, Century 21 Hecht Realty, Parkdale Mills, and BSN medical. Following the collapse of the technology market in 2000, Nader had to reinvent himself and his company once again, building from the foundation of Cydecor and venturing into government contracting. Today he is the President of Cydecor and now, ten years following his accident, is servicing the Department of the Navy as a federal contractor. Nader is also a peer volunteer at Walter Reed Army Medical Center in Washington, D.C. and author of My Decision to Live. Charlotte Place Magazine captured Nader's amazing story. To download and read the article in PDF format, please click on the link below. 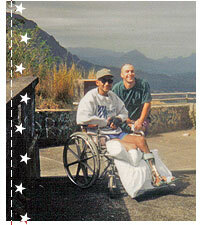 Nader is pictured in a wheelchair with his best friend, Brian Wallace, overlooking Kaneohe Bay in Hawaii less than five months after the accident. "Trying to recover my independence was a real struggle for me. I was usually down and this is my only picture from that time. My best friend, Brian, actually shaved his head after arriving in Hawaii to visit me just to get some laughs out of all of us. It worked!" ©Nader Elguindi. All Rights Reserved.